GM's message, VANC Celebrates, EMD Prepares, Budget Day is here! I hope this newsletter finds you well. This week started with a bang at the Neighborhood Council Budget Advocates meeting on Monday where your hard working advocates split up analysis on diverse budget issues to finish their white paper on the City budget. They also passed a motion objecting to any further delays or cuts to the Neighborhood Council elections and funding, which received support from the City Attorney's Office. Thank you to everyone who is weighing in on the proposed election budget! We're racing to get ready for Regional Budget Day and the Valley Plan Review Committee tomorrow as well as prepping for next week. On Monday, the Board of Neighborhood Commissioners will be taking on the stakeholder definition, reviewing the work of their standing committees. That evening the City Council Budget and Finance Committee is holding a special meeting to hear a report from the CAO and CLA on this and next year's budget and shortfalls. On Tuesday, our election report goes to City Council and our new funding report on the status of the current Neighborhood Council Funding Program and recommendations for a checking account goes to the Education and Neighborhood Committee. It was nice to take a tiny break to celebrate the 10th anniversary of the Valley Alliance of Neighborhood Councils last night with representatives from all 34 Neighborhood Councils in the Valley. Founder and Chair, Jill Banks Barad, received a surprise "Got It" Award from her Executive Committee for her inspirational leadership all of these years despite the many challenges. 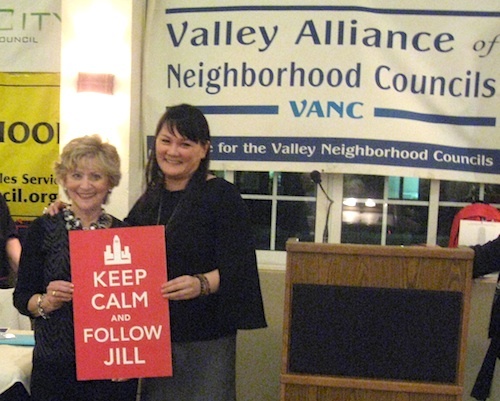 I was also happy to acknowledge Jill and the VANC's visionary ways for the Neighborhood Council system with a new twist to the famous Keep Calm and Carry On British poster from World War II. I look forward to seeing you at Regional Budget Day and the Valley Plan Review Committee tomorrow! Regional Budget Day is here!